One of the best things in the world, in my opinion, is when you’ve been thinking about and discussing a subject for a while and come across a book by chance that deals precisely with that topic - in this case, the subject of automation and the enormous changes that it is having, and will have, on the world’s economic and political systems. A New York Times bestseller and recipient of the Financial Times and McKinsey Business Book of the Year Award in 2015, the book handles the subject expertly. Martin Ford is the founder of software development firm based in Silicon Valley and has written two books on the subject of artificial intelligence (AI) and automation and their effects on society, employment and the economy at large. Rise of the Robots systematically goes through the effects of automation on the economy and society, from the traditional areas of factory/manufacturing jobs through its advance into the service sector, typical office administrative jobs and even to the managerial level. 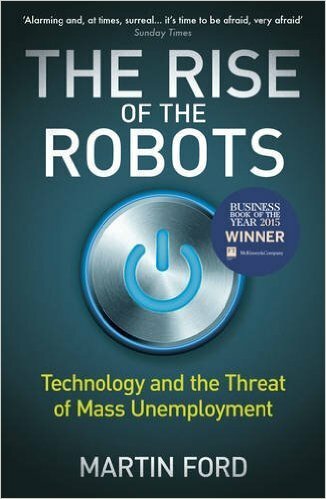 The premise of the book is that while we have seen the effects of automation for a long time, a combination of factors - Moore’s Law (the doubling of processor speeds over approximately 18 months), advances in AI and the ability of computers to self-learn, the spread of fast broadband fibre and cloud computing - are converging to make changes in the workplace, economy and society that will be fundamental and irreversible. Ford’s focus is primarily on the US, both in terms of historical reference and statistics, but the lessons can be applied globally. Ford makes an excellent case, for instance, that China and India may be worse off when it comes to advancing automation than the US, due to the lack of a widespread service economy that has historically been the transition from a manufacturing based economy. Unlike the West, China and India will go from labour intensive manufacturing-based economies straight to highly automised societies without the intervening service and consumer-based purchasing economies. What this will mean to the burgeoning middle class in China is anyone’s guess, but it may be that the current wage growth of China will stagnate or even decline with automation and the disappearance of jobs. This in turn could cause extreme societal pressures. This is not to say that the US and Europe get off easy. The effects of advanced AI and atomisation will have profound effects there as well; the US suffering to a larger degree due to the increasing inequality in society and the lack of a European style welfare state. As Ford describes, the ‘low-hanging fruit’ of jobs that can be replaced by automation has already taken, such as robots manufacturing cars. The next step, where robotics are combined with AI, is the automation of low-level service jobs such as fast-food restaurants and warehousing. Following that, logistics and transport industries, and mid-level data processing jobs such as para-legals and administrative positions are susceptible. Ford also writes about IBM’s Watson project and how IBM gave themselves enormous challenges (from playing chess grandmasters to defeating trivia champions on televised game shows) and succeeding in creating a cloud based AI computing system that is now focusing on solving healthcare issues by absorbing and processing enormous amounts of medical data. The success rate for these projects, Ford argues, equals the progression of Moore’ Law and achieves accuracy levels that surpass trained human professionals. Ford also includes fascinating chapters on the potential downsides of AI, reflecting on the possibility of superhuman intelligence in machines, and nanotechnology. The book ends with some of Ford’s (and others) ideas about how society will have to be restructured to cope with massive amounts of job loss arising from robotics and automation. While the book is rooted in business and economics, the central subject is the transformational power of computer science and technology. It is a well-argued and balanced book chock full of interesting historical descriptions and details of the development of computer science and technology, and how we have gotten to where we are, including a very clear-eyed look at where we are going. In my opinion, this book is a must read for anyone interested in technology, business, economics, politics and society.